Animal Defenders International : Animal rescues : Into the wild, freedom at last! Into the wild, freedom at last! Orlandito and the other capuchin monkeys were torn from their forest homes by pet dealers. They were confiscated but, like so many animals, ended up in limbo in a holding centre. After years of determined work, this summer their cage door was opened and they returned to the Colombian forest, free again, at last. Orlandito was illegally trafficked, then rescued by Colombia’s environmental police and placed in the Unity Rescue and Rehabilitation of Wild Animals Centre (URRAS) in Bogotá. Here Orlandito was placed with two female capuchins, Meekú and Cibroa, and a young male, Jivi, to form a release group when a suitable site was found. The first site chosen seemed perfect but complications with permits prevented their release – a devastating blow. After negotiations with local authorities a site was identified in a remote location near Yopal, in north east Colombia. With a warm climate, a forest abundant with primates and a variety of tree species including mango, guava, blackberry and jobo trees the location was perfect. ADI paid for the construction of a mobile acclimatisation enclosure, which would enable the monkeys to experience the sights, sounds and smells of the forest in safety. In this our monkeys would experience the forest environment and interact with other animals. As their relocation date approached, small transmitter collars, designed to stay on for up to six months, were attached to each of the four monkeys. Tracking them during their initial release is vital, to monitor movements, identify social changes and interactions, and to verify their survival. Once their collars drop, these monkeys will simply disappear into the forest forever. In April the monkeys were loaded onto an aircraft in Bogotá, the destination Yopal; freedom is in sight. Throughout the short flight the monkeys remained calm. They could not have imagined what would await them. 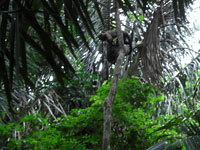 Upon touchdown the ADI team drove to the release area, then trekked through the forest to the acclimatisation enclosure. Although free to leave, Orlandito and chums remained in the security of their travel crates before finally, in the early hours, taking their first tentative steps into their new enclosure – home for the next 21 days. Over the following days, Orlandito, Meekú, Cibroa and Jivi began to relax. With a diet of fruit rich in water to keep them hydrated, they settled into forest life. Their diet of familiar fruits expanded to include local wild forest fruits, coconuts, wild guavas, mangos and bananas. Some of the more unfamiliar varieties needed encouragement, so they were shown how to open and consume the fruit; they learned fast. They also gorged on an abundance of insects; Jivi proved to be particularly quick in snatching any opportunity to vary his diet. The ADI team monitored them each day, and it was clear that the Orlandito family were all doing well; their fur was looking better then ever and they had gained a little weight. On Saturday 8th May, the cage door was opened. Cibroa was the first out, darting into a nearby tree, followed by Meekù. Jivi hung back as if to try to entice Orlandito out, but soon the temptation grew too much and, like the females, he bolted for freedom. It was to be 8 long minutes before Orlandito mustered the courage to join them, but soon he, too, was out in the forest. They were free at last. Staying close to the enclosure, the group explored the surrounding area, excitedly darting from tree to tree. The ADI team stayed for some time to keep watch before leaving; it was a poignant moment when we had to leave them to fend for themselves. Over the following days the group was monitored from a distance using the tracking device. Initially our team left food in trees, but it wasn’t long before the monkeys were feeding themselves and thriving in their new world, a truly glorious sight. However, on day 6 the signal for Orlandito was lost. For 14 days the team searched the forest, to no avail. The rest of the group was located, but no Orlandito; the team started to fear the worst. Thankfully, on day 21 Orlandito’s signal was picked up, much to everyone’s relief. But still no sighting. Finally on day 23 he was spotted near the enclosure with the group, he was alive and well. Subsequent visits have found that the monkeys are thriving, and are staying close to a group of 6 howler monkeys, possibly for security. We are delighted with their progress, and will continue to monitor them over the next few months. Thank you to everyone who donated towards this remarkable release, a magnificent triumph for the animals.